As landlord, you have a legal responsibility to maintain the property in good condition. If the tenant’s request for a repair is reasonable and minor, we take care of it quickly. We want to respond promptly, as it is in your best interest to maintain a good relationship with the tenant. This normally results in the tenant taking better care of your property and tends to result in them staying longer if they know repairs are completed quickly. When there is a repair that needs to be addressed, we review the age and condition of the item with the repairman and consider replacement cost versus the cost of repair. We will then make our recommendation to you. If you know that any of your appliances may need to be replaced, let us know ahead of time if there is a specific replacement you would like. Some things will need to be replaced immediately like the hot water heater, but we will try to coordinate with you on the replacement if time allows. We always get the most requests for repairs when a tenant first moves into a property. We do not allow tenants to make repairs themselves. It is a liability for you! We generally agree to repair minor maintenance items if the request is reasonable. Preventative maintenance is a great way to help reduce long term repair costs. When we perform an inspection of your property we may identify noticeable deterioration of things. If we do we will provide you our findings that may be accompanied by an estimate to remedy the issue. These will not be things that need to be done immediately but may be things that need to be addressed in the near future. HVAC: We recommend that you have in place an HVAC contract. This helps maintain your Heating and Cooling system and provides a vendor who consistently services your systems. Pest Treatment/Termite Pest: A pest contract is highly recommended. It helps address many types of insects and specifically termites. This is an excellent investment in your property. 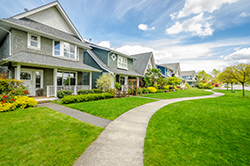 Tenants do not like to maintain yards and they will almost always not maintain it as well as you. This service helps ensure that the yard is kept up to its current condition and helps rent your property quicker. *If you are interested in any of these contract services, please let us know and we can help set them up for you. If you already have them in place you must provide us the contract and provide the vendor our information to coordinate the service. Peabody Residential utilizes only reputable, fully licensed firms that are able to respond quickly and provide skilled and fully trained labor. Because we have developed a business relationship with these firms and provide them with repeat business, we also have achieved preferential status which enables our clients to consistently obtain high quality, guaranteed service. Our vendors are not necessarily the least expensive contractors who may be available at any given time. They are reliable and their work is consistent, which is far more meaningful in a long term business relationship. We do not charge our clients any add-on, supervision or overhead fees. Contractor Preference- Occasionally homeowners request that we utilize the services of a contractor or vendor that is already in place (due to an existing service contract) or someone they feel would provide services at a lower cost.